Eu Yan Sang Liva Max™ which contains 100% Antrodia Cinnamomea (AC) Mycelium, is a natural health supplement that supports liver health and general well being. AC is a highly valued herb found only in Taiwan and is a trusted remedy for promoting liver health and alleviating liver conditions. 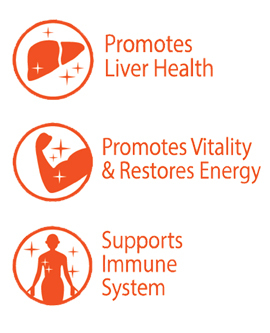 Eu Yan Sang Liva Max™ can also be used to promote vitality, enhance body functions and improve immunity. rDNA testing, Herb "Finger Printing" and Hazard Analysis & Critical Control Point (HACCP) Practice are applied to ensure a premium product with the highest quality and safety standards. Each capsule contains Antrodia Cinnamomea Mycelium 500mg. Store in a cool dry place below 30°C. Avoid direct sunlight. Keep out of reach of childen. Avoid consumption when suffering from fever, influenza and during menstruation. Not be taken with other medication. Not suitable for young children, pregnant & lactating mothers. How do Traditional Chinese Medicine (TCM) physicians view cancer? Tips to boost longevity and help you live a life that is more fulfilling and enjoyable.